Disney Infinity is a collectible toy line, a world creation platform, and an action platformer. It’s a game where Pirates of the Caribbean’s Jack Sparrow can race Cars’ Lightning McQueen through Cinderella’s castle. It’s a game where Monsters U’s Sully can dodge behind The Lion King’s Pride Rock while having a paintball fight with The Incredibles’ Syndrome. It’s a game where The Lone Ranger’s Tonto can shoot Aladdin’s Palace Guards before leaping off a skyscraper and using a wingsuit to glide to safety. It’s a whimsical merger of genres and settings and worlds--the perfect celebration of the past, present, and future of Disney. Problem is, it isn’t very fun. Before you play you’ll need to plug in the Disney Infinity base and physically put toy figures into their spots, watching as they appear in the game world almost instantly. It’s a gimmick, sure, but it’s a darn good one, and there’s something incredibly cool about dropping a well-detailed, high-quality Jack Sparrow toy onto a plastic rhombus and watching him pop into existence with a wink and a smile. Levels, too, are represented by physical toys; out of the box, Infinity comes campaigns for Monsters U, Pirates of the Caribbean, and The Incredibles, with each “Play Set” clocking in at about four hours. While they’re all part of the same core game, each provides a surprisingly different experience. There’s some entertainment in completing these levels, but they all suffer from a bloat of filler content. Each four-hour campaign has only a handful of exciting segments (Pirates of the Caribbean's ship combat, in particular, is pure fun), while the other three-and-a-half hours are spent completing what amounts to basic fetch quests. This is most obvious in The Incredibles’ Play Set, which has you dashing through a boring city and completing the same few tasks. Repetitive missions also bog down the Pirates of the Caribbean and Monsters U sets, but they both manage to be entertaining despite the lack of mission variety. Other problems are even more frustrating--you’ll struggle to play for more than ten minutes at a time without something going wrong. There are random framerate drops, misleading missions, and a number of technical glitches that halt any momentum the game gains. Don’t be surprised if you need to occasionally restart a mission because of a technical hiccup that renders it unbeatable, and don't be surprised if it happens more than once. The Play Sets do serve a purpose besides simply acting as content, though--they're a dumping ground for capsules containing customization options that can be used in the Toy Box, the world-building tool in Infinity. While you can’t mix and match themes in the Play Sets (preventing you from playing co-op out of the box, since it only comes with one character from each franchise), you can do whatever you want in Toy Box. Want to make a 2D platformer where you jump on aliens from Toy Story? Easily done using the 2D camera tool. Interested in trying to make a wave-based horde-style mode where you protect Scrooge McDuck’s Money Bin? Totally possible! The Toy Box, as a concept, is astounding, and should give you the ability to make your own scenarios and levels. The included tutorials do a good job of showing what is technically achievable, but Disney Infinity is held back by strange design decisions. As you complete missions you’re given tokens used to unlock random items in the Disney Vault. There are over 1,000 items, from the aforementioned 2D camera to hundreds of other cosmetic options to customize your level. Therein lies the problem: in order to unlock the tokens that give you spins at unlocking items, you need to grind missions. That'd be fine if everything you could unlock was purely cosmetic, but considering important tools are mixed in with hundreds of aesthetic tweaks, there's a good chance you’ll have to play for dozens of hours to get the essential tools you need to create even the most basic map. There’s more to the Toy Box than the creation aspect, though--you'll also be able to share and download other people’s levels. This provides a glimmer of hope for the mode, as there will surely be people that put in the necessary time to work with the tools to create fun experiences. There are also Adventures in the Toy Box--short minigames that can be played with two to four players using whatever characters you want. The included handful are fun (and tricky, if you’re aiming to get the highest score), and each character comes with their own themed Adventure. Even those who don’t have their own stand-alone Play Set, like Ralph or Jack Skellington, will come with enjoyable levels set in their own worlds. You’re going to love Disney Infinity before you play it. You’ll tumble the incredibly well-made toys in your hands and think about the characters Disney could potentially add in the future (Star Wars! Marvel!). But once you start to play, and once you stumble over the technical issues, and once you find that there are barriers around every turn, you’re bound to find that you’re in love with what you think Disney Infinity could be, and not what it actually is. There's some validity to that, since what it could be is genuinely exciting--patches might fix some of the issues and future Play Sets (Star Wars! Marvel!) might trump the trio included with the game. But as of now Disney Infinity is a flawed experiment, and far from the magical experience you're looking for. The more time you put into Disney Infinity, the more you'll realize it's a game meant to be purchased and appreciated--not played. ...which is a shame if you're purchasing it to, you know, play it. 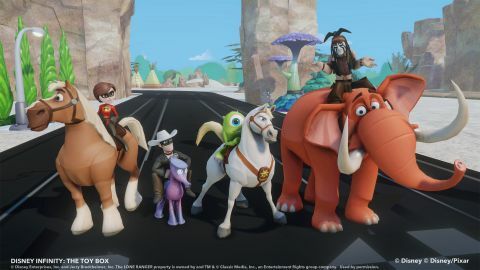 Description Disney Infinity is an upcoming open world sandbox game featuring characters from Disney and Pixar movies and tv shows.